In the past decade, the rush to technology has created several flaws in terms of managing computers, applications, and middleware and information systems. Therefore, organizations struggle to understand how these elements behave. Even today, as Enterprise Architectures grow in significance and are acknowledged as advantageous artifacts to help manage change, their benefit to the organization has yet to be fully explored. 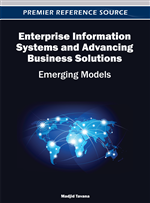 In this paper, the authors focus on the challenge of real-time information systems evaluation, using the enterprise architecture as a boundary object and a base for communication. The solution proposed is comprised of five major steps: establishing a strong conceptual base on the evaluation of information systems, defining a high level language for this activity, extending an architecture creation pipeline, creating a framework that automates it, and the framework’s implementation. The conceptual framework proposed avoids imprecise definitions of quality and quality attributes, was materialized in a model-eval-display loop framework, and was implemented using Model Driven Software Development practices and tools. Finally, a prototype is applied to a real-world scenario to verify the conceptual solution in practice. Laudon and Laudon (2009) describe the importance of knowledge and knowledge management in the today’s enterprises. Even though humans have the innate trait of self-awareness through consciousness, organizations — becoming more and more living complex social organisms — fail to automatically develop similar capabilities of sensing and learning. This task then falls upon the individuals, who must work together, interact and share knowledge and, therefore, engage the task of sense-making as to improve the collective self-awareness. To transfer knowledge, communication must be done through known shared boundary objects that are described using a set of concepts and with a semantics which cannot be ambiguous. The need for Organizational Knowledge is already a widely accepted fact, and in order to improve the holistic view of the Organizational Structure, Enterprise Architectures have been proposed as valuable artifacts due to their communicative nature (Magalhães et al., 2008). With mechanisms to represent organization blueprints, easy-to-use notations to describe high-level requirements and real-time processing, enterprises will become increasingly aware of themselves and their ecosystem, and will be able to make quicker, smarter and better informed decisions. To increase the collective organizational knowledge, information has to be applied, which in turn can only be produced by processing relevant data in the first place (Ackoff, 1989). The ability to collect more data from more organizational sources is there unavoidably valuable. We will focus on the use of data produced by operation systems, middleware, applications and other technological elements to better understand how the technology and information layers of deployed enterprise architectures behave in real-time. Regarding architectural representations as boundary objects, we intend to take advantage of their creation and maintenance to encourage stakeholders in an enterprise to discuss, define and perform evaluation through the definition of quality attributes. This research therefore addresses today’s inability to evaluate systems in real-time through the “eyes” of Enterprise Architectures. The rest of the paper is organized into four sections. Next section provides an overview of related work regarding Enterprise Architectures, quality evaluation and modelling instrumentation. The following section presents the proposed solution: the conceptual abstraction, the Model Processing Framework and its implementation. Next we present a case study of the implementation of the developed prototype in the Telecommunication industry. The final section presents the conclusions and the future work suggestions.